Today we’re pleased to announce the third deal in the DigitalRev series. For the next week only, you can save $20 on a Canon EF 70-200mm f/2.8L IS II Lens and receive FREE Shipping on your order. 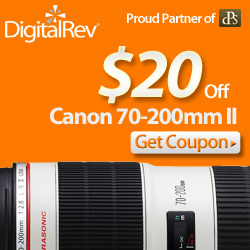 Visit this special page on digital rev for you to take advantage of the offer. The EF 70-200mm f/2.8L IS II USM is the professional photographers workhorse telephoto zoom lens. Using Fluorite to improve image quality, it has a rugged durable design and 4-stop Image Stabilizer As the most popular lens of many professional photographers, the EF 70-200mm f/2.8L IS II USM matches Canon’s highest standards of L-series optics, build quality, reliability and operability. An improved robust construction includes dust and moisture resistant seals to protect against harshest weather conditions. With a fast /2.8 aperture shooting in low light conditions is possible. This high speed aperture can also be used to ensure a shallow depth of field making the subject stand out against a cluttered background. Featuring Canon’s 4-stop Image Stabilizer (IS), making the lens ideal for low light conditions when a tripod can’t be used. The Image Stabilizer system allows shutter speeds of up to 4 stops slower than normal to be used without causing image blur. Fluorite and Ultra low dispersion (UD) lens element for the highest image quality Featuring a lens element made from Canon’s unique high performance Fluorite, chromatic aberration is minimised. As well as the use of Fluorite, 5 UD elements are also used to ensure excellent image quality, high contrast and natural colour reproduction throughout the zoom range. Beautiful background blur with 8 blade circular aperture Thanks to a circular 8 bladed aperture, beautiful background bokeh is possible, isolating subjects at wide apertures. Using a ring type USM (Ultrasonic Motor) and new AF algorithm to drive the high speed auto focus with ultra quiet operation. Full time mechanical manual focus override is also available without having to switch out of AF. The minimum focusing distance has been reduced to 1.2m allowing photographers to stand closer to the action. The lens is supplied as standard with the ET-87 lens hood to prevent glare affecting images, as well as a removable tripod mount and the LZ1326 soft case for easy transport. This deal is only available for one week. Don’t miss out!